Presented in this paper is the authors’ research of the different applications of the newest information technologies in agriculture. Provided in this article is information concerning the use and application of GPS receivers and GIS software, which are valuable for the up- to-date agriculture. These technologies and their applications provide numerous possibilities, as for example mapping of the nature’s resources, evaluation of the environmental impact, mapping of different soil types, etc. The different applications of the available hardware and software, which affects the efficacy and productivity of the agricultural activities, were analysed. Low-cost RTK-GPS receiver is represented. A technology for the data processing of the digital mapping information is provided as well. New laser rangefinder scanners were developed specifically for drivers’ assistance and autonomous guiding in road vehicles. These sensor systems were tested in the past years regarding the potential for agricultural engineering purposes. In a first part of the paper a 2D laser rangefinder scanner was tested for detecting round bales on a harvested field from winter rye. In a second part the laser scanner was used for modelling crop stands and measuring crop biomass in winter wheat (R2=0.96) and maize (R2=0.95). In a third part, it was demonstrated that the height of the reflection point increased in a considerable manner depending on the detecting angle of the laser beam; resulting in an overestimation of crop height respectively of crop biomass. Is it briefly described condition machine-tractor parka agricultural production at present. The formed crude structure of the system of the technical service in ACI Siberia. The offered mechanism of the shaping the system of the provision to capacity to work of the farm machinery on base of the motivation her parameter with the help of model forming: facilities, region, technical centre, specialized repair enterprise. The article proposes a new rotary tillage implement for the surface soil treatment, which is based on an analysis of existing designs. This tool can be used as a separate unit, or as part of combination machines. It provides an effective weed combing process, dropping them on the field surface, the simultaneous crumbling, creating crumbly soil structure and the rolled seed boxes for rake crops. 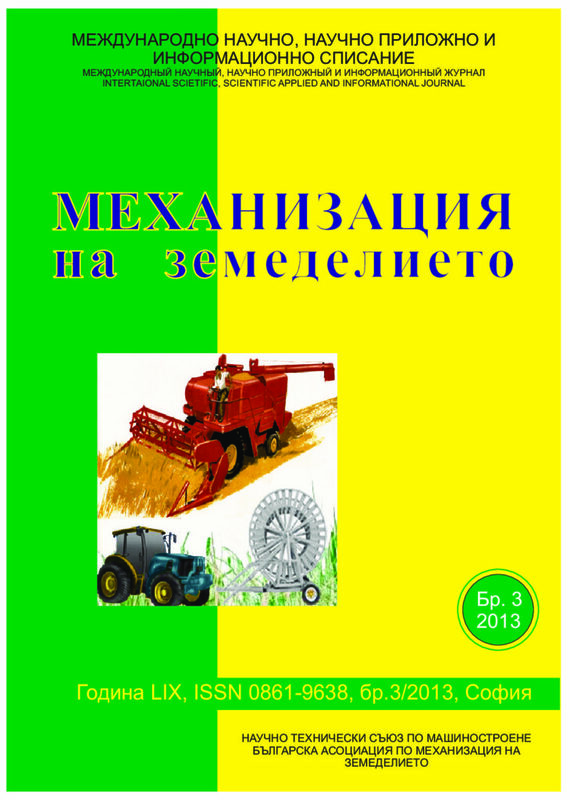 This article presents the developments of scientific research institute of farm mechanization of Southern Ukraine under Tavria State Agrotechnological University (Melitopol). They deal with complex implements as parts of power units with classical and integrated arrangements and front hitch.